Such devotional prayers or acts may be accompanied by specific requests for Mary's intercession with God. There is significant diversity of form and structure in Marian devotions practiced by different groups of Christians. Orthodox Marian devotions are well-defined and closely linked to liturgy, while Roman Catholic practices are wide-ranging – they include multi-day prayers such as novenas, the celebration of Canonical coronations granted by the Pope, the veneration of icons in Eastern Christianity, and pious acts which do not involve prayers, such as the wearing of scapulars or maintaining a Mary garden. Marian devotions are important to the Roman Catholic, Orthodox and Anglican traditions, but most Protestant views on Mary do not accept them, because such devotions are not recorded or promoted in the Bible. They believe this devotion may distract attention from Christ. 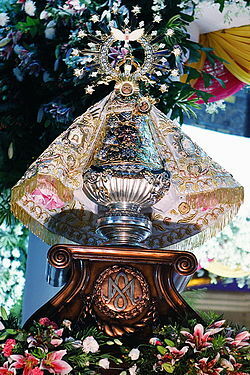 According to practitioners, devotion to the Virgin Mary does not amount to worship, which is reserved for God. 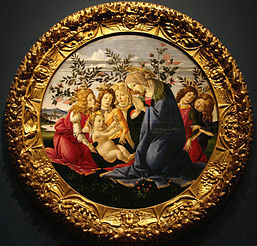 Both the Catholic and Orthodox traditions view Mary as subordinate to Christ, but uniquely so, in that she is seen as above all other creatures. In 787 the Second Council of Nicaea affirmed a three-level hierarchy of latria, hyperdulia and dulia that applies to God, the Virgin Mary and then to the other saints. 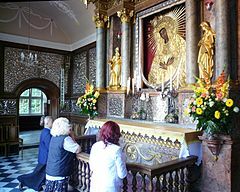 In the Orthodox view, devotion to Mary is considered an important element of Christian spirituality, and indifference to her by other Christian denominations is troubling to the Orthodox. Orthodox theologian Sergei Bulgakov called denominations that do not venerate the Virgin Mary "another type of Christianity". The Angelus is a traditional prayer used to commemorate the Annunciation of the angel Gabriel to Mary. It is used three times daily: at dawn, mid-day and at dusk. During Eastertide, the Angelus is replaced with the Regina Coeli an antiphon, dating from the tenth or eleventh century. The Rosary, or Psalter of the Blessed Virgin Mary is essentially a contemplative prayer. The Litany of Loreto is the most well-known Marian litany. Apparition-based: These include well-known and formally approved Marian apparitions such as Our Lady of Guadalupe, Our Lady of Lourdes, Our Lady of Fatima or Our Lady of Akita, and a multitude of regional devotions across the continents from Our Lady of Good Health in India to Our Lady of Licheń in Poland as well as Our Lady of Good Help, the first Marian apparition approved by the Catholic Church in the United States. Such devotions have usually resulted in the construction of major Marian churches. ^ Directory on Popular Piety and the Liturgy 2001. ^ "Catholic Encyclopedia: Popular Devotions". Retrieved 16 December 2014. ^ Josemaria 2008, pp. 173-175. ^ Mary: Grace and Hope in Christ 2006, p. 52. ^ McNally 2009, p. 169. ^ Duckworth 2004, p. 118. ^ "Introduction". Shrine of Our Lady of Walsingham. Archived from the original on 12 September 2016. Retrieved 16 December 2014. ^ Duckworth 2004, pp. 125-126. ^ Schroedel 2006, pp. 81–85. ^ Mary: Grace and Hope in Christ 2006, pp. 7–10. ^ "Liturgy of the Word in honour of the Icon of the Mother of God of Kazan - August 25, 2004". Retrieved 16 December 2014. 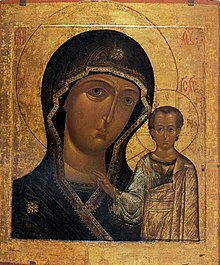 ^ "Lauds in honour of the Blessed Virgin Mary, before the ancient icon of Our Lady, Mother of God of Kazan". Retrieved 16 December 2014. ^ a b McNally 2009, pp. 168-169. ^ Schroedel 2006, p. 90. ^ Pope Paul VI. "Apostolic Exhortation Marialis Cultus". Retrieved 16 December 2014. ^ Pope John Paul II. "Apostolic Letter Rosarium Virginis Mariae". Retrieved 16 December 2014. ^ "Shrine of Gualdalupe Most Popular in World". ZENIT International News Agency. Retrieved 1 Oct 2010. ^ "Our Lady of Siluva". Marian Library, University of Dayton. Retrieved 16 December 2014. ^ McNally 2009, pp. 144-147. ^ Josemaria 2008, pp. 401-403. ^ Directory on Popular Piety and the Liturgy 2001, § 188. ^ "Agenzia Fides - Congregazione per l'Evangelizzazione dei Popoli". Fides.org. Archived from the original on 2009-06-15. Retrieved 2009-05-05. ^ "Address to the participants of the International Symposium on the Alliance of the Hearts of Jesus and Mary". Retrieved 16 December 2014. 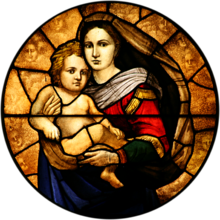 ^ "Catholic Encyclopedia: St. Anne". Retrieved 16 December 2014. ^ "Catholic Encyclopedia: Raccolta". Retrieved 16 December 2014. ^ "Thousands of pilgrims throng Velankanni for Christmas". The Hindu. Retrieved 16 December 2014. ^ "Address at Blessing of Marian Shrine (Lichen, 7 June 1999)". Retrieved 16 December 2014. ^ "Catholic Encyclopedia: Scapular". Retrieved 16 December 2014. Herbermann, Charles, ed. (1913). "Devotion to the Blessed Virgin Mary" . Catholic Encyclopedia. New York: Robert Appleton Company. Duckworth, Penelope (2004). Mary: The Imagination of Her Heart. ISBN 1-56101-260-2. Josemaria, Brother Anthony (2008). The Blessed Virgin Mary in England. ISBN 0-595-50074-9. Mary: Grace and Hope in Christ: The Seattle Statement of the Anglican-Roman Catholics. Anglican/Roman Catholic International Group. 2006. ISBN 0-8264-8155-8. McNally, Terrence (2009). What Every Catholic Should Know about Mary. ISBN 1-4415-1051-6. Schroedel, Jenny (2006). The Everything Mary Book. ISBN 1-59337-713-4. "Veneration of the Holy Mother of God". Directory on Popular Piety and the Liturgy. Vatican City: Congregation for Divine Worship and the Discipline of the Sacraments. 2001. Retrieved 16 December 2014.